Ride the open top double decker Big Bus for one, two or three days and explore London! Hop on and off at over 50 stops on three different routes located conveniently close to famous landmarks and attractions. Get your Big Bus Tours tickets from home and get ready to hop on and off the buses to explore as often as you wish, and rejoin the tour once you're ready. Enjoy daily free walking tours allowing you to marvel in British Royalty, the gruesome, ghostly past or Harry Potter. You also get a free scenic river cruise. The Classic Red takes in the best of historic London from Hyde Park to Tower Bridge, via Big Ben, the London Eye and St Paul’s Cathedral. The Blue Route also stops off at Harrods and London's best museums. The Green Link passes through Bloomsbury, passing the British Museum connecting passengers with St Pancras and Euston stations. You decide where to start your tour. Just hop on the first Big Bus and start exploring London. Your tickets is valid for 1, 2 or 3 consecutive days. 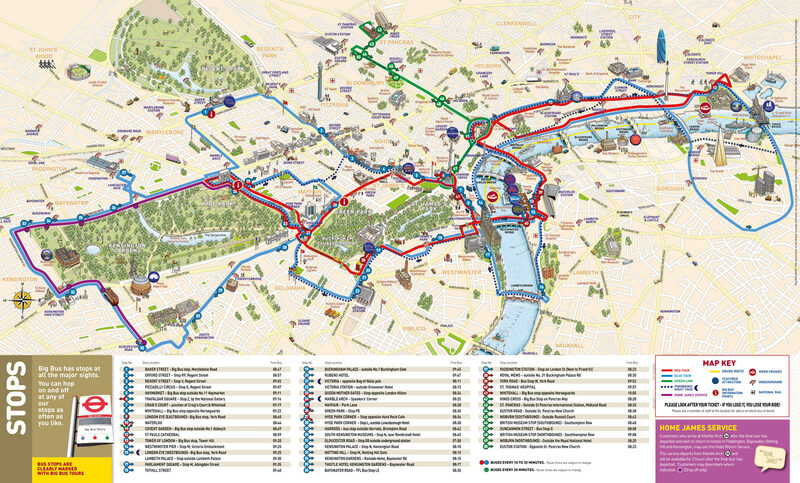 The Red Route lasts 2.5 hours, the Blue Route lasts 3.5 hours & the Green Route lasts 1.5 hours. Summer: Every 10 minutes (Red/Blue), every 20 minutes (Green). Winter: Every 30 minutes weekdays and every 20 minutes weekends (Red), every 20 minutes (Blue), every 30 minutes (Green). Where does the walking tour start? The walking last approximately 1½-2 hours and leave from Trafalgar Square; Big Bus Stop #10.